Every once in a while we receive Lifecycle questions in regards to different versions of Microsoft Dynamics GP. This should help to answer some of those questions. You will see engineers make reference to Mainstream Support and Extended Support. 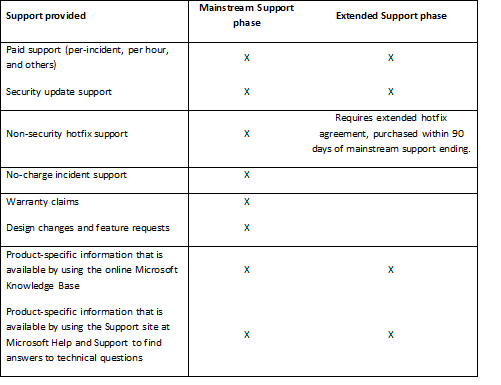 Here is a chart that outlines the differences between Mainstream Support and Extended Support. Microsoft Dynamics GP 10.0 is already in its' extended support lifecycle, which will end on 10/10/2017. If you are currently on Microsoft Dynamics GP 10.0, you will definitely want to ensure that you are making plans to upgrade to a later version of Microsoft Dynamics GP. Mainstream Support for Microsoft Dynamics GP 2010 ended on 10/13/2015 which means that you will no longer receive tax and year end updates. Microsoft Dynamics GP 2010 is now in its' extended support lifecycle. This will be ending on 10/13/2020. Mainstream Support for Microsoft Dynamics GP 2013 will end on 4/10/2018 which means that at that point in time, you will no longer receive tax and year end updates. Microsoft Dynamics GP 2013 will then move into Extended Support until 4/11/2023. Mainstream Support for Microsoft Dynamics GP 2015 and Microsoft Dynamics GP 2015 R2 will end on 4/14/2020 which means that at that point in time, you will no longer receive tax and year end updates. Microsoft Dynamics GP 2015 will then move into Extended Support until 4/8/2025. Mainstream Support for Microsoft Dynamics GP 2016 and Microsoft Dynamics GP 2016 R2 will end on 7/13/2021 which means that at that point in time, you will no longer receive tax and year end updates. Microsoft Dynamics GP 2016 will then move into Extended Support until 7/14/2026. With the information provided above, if you are currently on Microsoft Dynamics GP 2010 or earlier, you will definitely want to have a plan in place in regards to upgrading to Microsoft Dynamics GP 2013, Microsoft Dynamics GP 2015 or Microsoft Dynamics GP 2016 (when it releases). Upgrade services are available for upgrades to a supported version of Microsoft Dynamics GP according to the Microsoft Product Lifecycle Policy. For example, upgrading from Microsoft Dynamics GP 2010 to Microsoft Dynamics GP 2016. Customers: If you have any questions regarding upgrade services, please reach out to your Partner to get the ball rolling for a potential advisory service request. Partners: Please open up a non-chargeable support request with the Microsoft Dynamics GP Support Team to review to determine if it is an advisory request that we will be able to take on at this point in time. Thank you! Be sure to check back to the Microsoft Dynamics GP 2016 Upgrade Blog Series Schedule page to review upcoming blog posts related to Upgrading Microsoft Dynamics GP and other helpful resource links. Does that mean that GP 2013 R2 will also as GP 2013 ?